CENTRAL HEATING PACK COMBI BOILER T11 T22 RADIATOR TRV LOCKSHIELD VALVES CLEANER. 1 x GAS COMBI BOILER & FLUE KIT. 3 x DOUBLE PANEL DOUBLE CONVECTOR TYPE 22 RADIATOR 600mm High x 1000mm wide DPDC. 3 x SINGLE CONVECTOR SINGLE PANEL TYPE 11 RADIATOR. 600mm High x 500mm wide SPDC 400mm High x 1000mm wide SPDC 400mm High x 700mm wide SPDC. 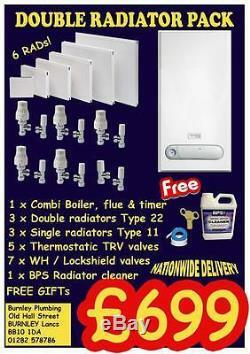 5 X THERMOSTATIC TRV VALVES 7 X WH/LOCKSHIED VALVES 1 X BPS RADIATOR CLEANER DONT FORGET OUR FREEBIES! Best prices on the net from BPS. Can be collected or we can deliver NEXT DAY. We aim to beat any lower price. We instantly process your order using this method. Cheques to be payable to BURNLEY PLUMBING SUPPLIES LTD. And processing for cheque payments can take between 10 to 21 days. You can also pay in person or via bank transfer. For collections please ensure that you have pre-arranged with us by telephone. Reasonable assistance must be provided to the driver to help unload. Please do not sign for the item until you are satisfied that it is in a perfect condition. Any discrepencies must be marked as damaged on the couriers note, and phoned through to us and the couriers office within 48 hours. Certain area's may be subject to surcharge including (but not limited to) highlands, grampians, ireland, europe, postcodes AB, IV, BT, PA, KW, PH, HS, ZE, KA. CURRENT TERMS AND CONDITIONS CAN BE FOUND BELOW. (Est 1990) - In business a lot longer than many other internet sellers over two decades. We take pride in our business by supplying quality products at huge discounts. Our operation runs across 4 UK locations & stock holding capacity in our own premises is over 80,000 sq. Our R&D team are constantly designing new and innovative products to supply the market demand. We are OPEN 6 DAYS a week for your convenience. E b a y Helpline. We have 10 lines which are open 6 days. Aftersales Department 0844 884 9686 Technical Department 0844 884 9680 Please note we can try to help but offer no guarantee or accept any liability from any advice we may offer, you are requested to qualify via an independant professional. BY POST / IN PERSON:- Hanover Chapel - Old Hall Street - Off Colne Road - Elm Street Business Park - BURNLEY - Lancashire - BB10 1DF - (UK). DIRECTIONS:- M65, exit Junction 10, follow signs to Elm Street Business Park. Get Supersized Images & Free Image Hosting. Create your brand with Auctiva's. Attention Sellers - Get Templates Image Hosting, Scheduling at Auctiva. The item "CENTRAL HEATING PACK COMBI BOILER T11 T22 RADIATOR TRV LOCKSHIELD VALVES CLEANER" is in sale since Saturday, August 19, 2017. This item is in the category "Home, Furniture & DIY\Heating, Cooling & Air\Radiators". The seller is "mish206" and is located in BURNLEY.